As my semester has drawn to an end, as the year draws to an end, I want to take some time to reflect on what I have learned in the last six months or so since I began this project in earnest and what I still want to learn and to accomplish as we start a new year. So first, what have I learned? 1. I’ve learned that I had two great-uncles whom I’d never known about. For at least two months of my research, I was sure that Joseph and Bessie had only had five children: Hyman, Tillie, Gussie, Frieda and Sam. When I kept running into a Max Brotman married to Sophie with children named Rosalie and Renee, I just figured Hyman had changed his name to Max. My mother didn’t know about her cousins Joseph, Saul and Manny, but she had met Rosalie and Renee, and I was sure they were Hyman’s daughters. 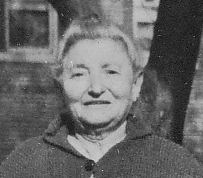 My mother knew that Hyman’s wife’s name was Sophie. 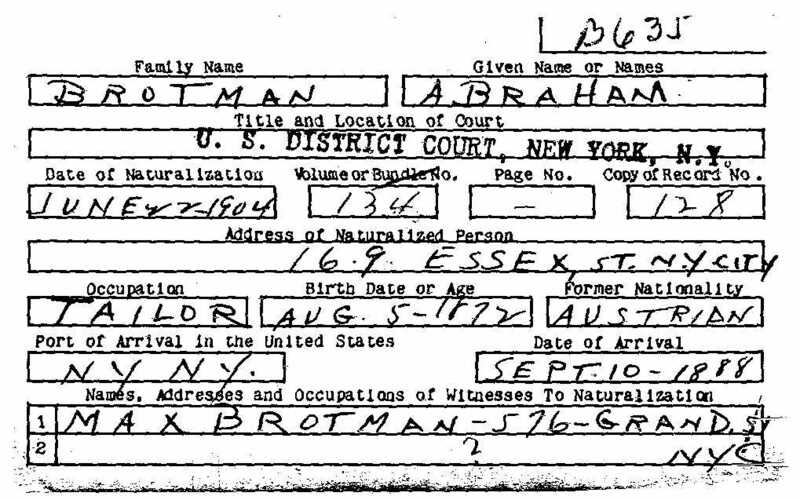 So instead of looking harder, I just assumed Max was Hyman and that the other Hyman Brotman married to a Sophie was not my relative. Only when I was able to find Max’s granddaughter Judy and Hyman’s grandson Bruce did I learn that Max and Hyman were BOTH my great-uncles, that both had married women named Sophie, and that Rosalie and Renee were the daughters of Max, not Hyman. That was a HUGE turning point for me and a big lesson. Lesson learned? Don’t trust memory alone, and don’t assume that documents are wrong just because family memories conflict with those documents. 2. The second new great-uncle was Abraham, and finding him was also somewhat of a lucky break. I ran across many Brotmans in my research, but most I assumed were not our relatives because I could not find any document linking them to our relatives and because no one in our family had ever heard of them. 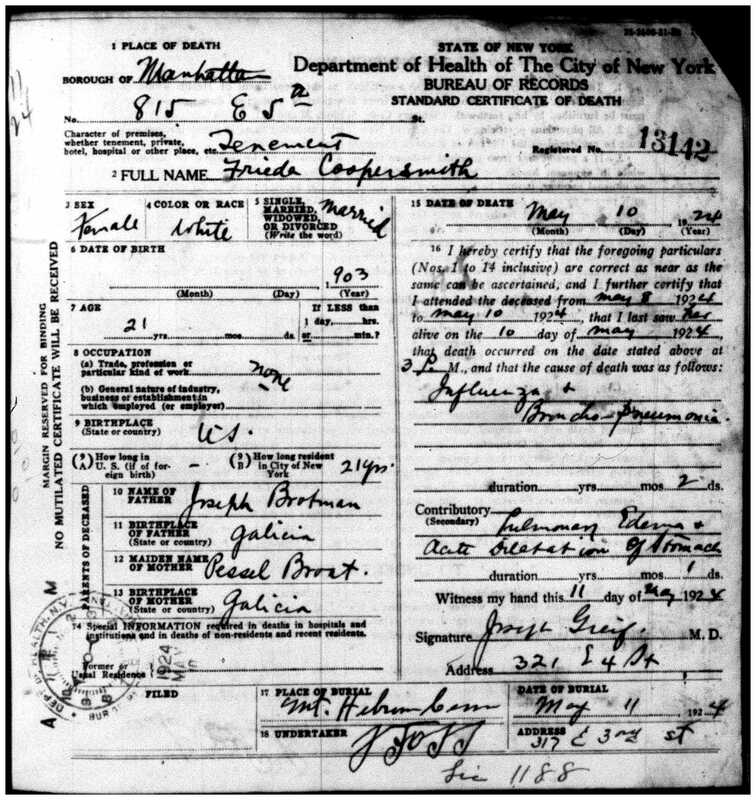 I can’t even remember all the details, but I recall that it was my brother Ira who found Abraham’s naturalization papers—I think (I am sure he will remember and correct me if I am wrong) it was in the course of looking into the Brotmanville Brotmans. When I saw Max’s name on those papers, I did not assume it was the same Max. (There were many Max Brotmans living in NYC at that time.) 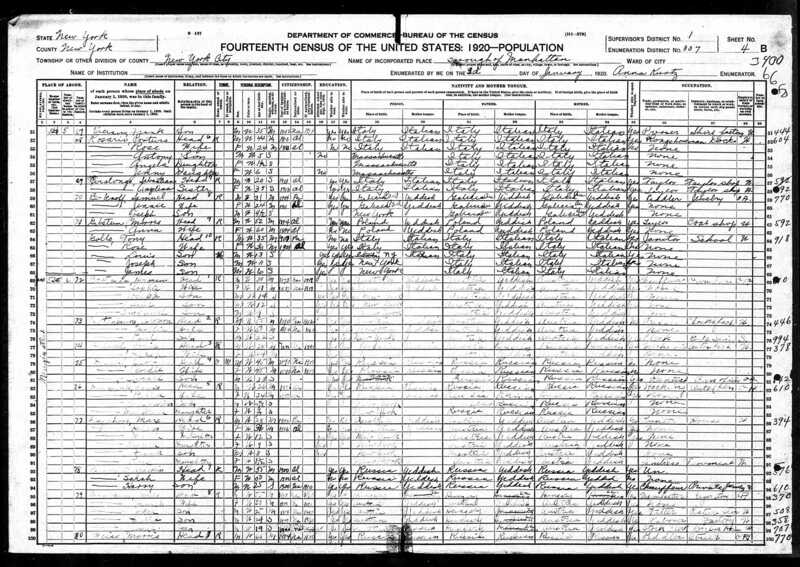 Once I checked the address for the Max on Abraham’s card against the address I had for Max on the census form from that same time period, I knew it was in fact “our” Max. 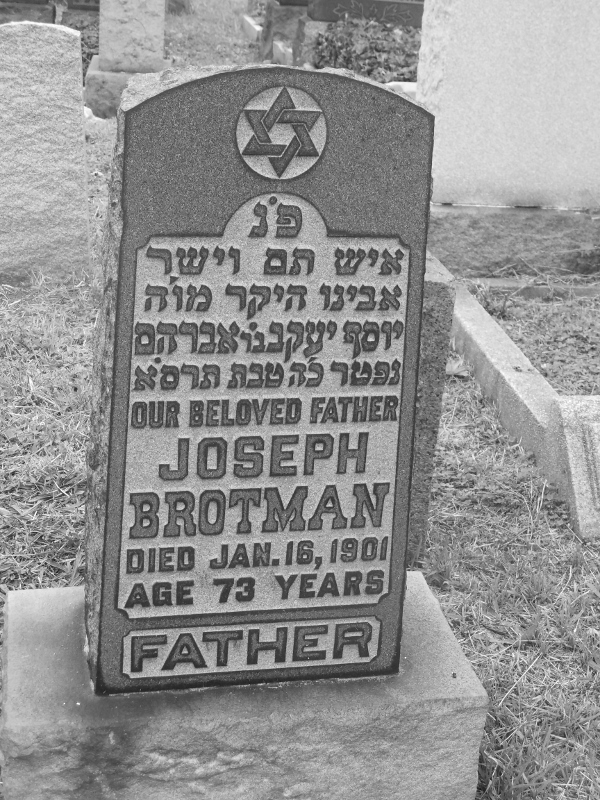 That led me on the search that brought me to Abraham’s headstone and death certificate, indicating that his father was also Joseph Jacob Brotman. Lesson learned? Don’t dismiss any clue. You never know where one document may lead you, even if in a direction you never expected. 3. Contrary to Lesson #1 and Lesson #2, I have also learned that often you cannot trust documents. Documents lie. People lie. People give bad information, and bureaucrats transcribe information inaccurately. People who transcribe handwritten documents for indexing purposes make errors. In particular, our relatives were entirely inconsistent when it came to birth dates and birth places. I now know why one relative found it so easy to lie about her age. It was family tradition. So lesson #3: Don’t assume that because it is written on some “official document” that it is reliable in any way. 4. One of my most rewarding accomplishments was finding out what happened to Frieda Brotman. Now we know who she married and how she died and even the name of her infant son Max, who only lived one day. We even know what happened to her husband Harry Coopersmith after she died. I never thought I’d be able to track down her story. That experience is what will keep me going as I continue to look for the answers to more questions. Lesson #4: Do not give up. Do not give up. Do NOT give up! 5. There are more helpful and supportive people in the world than there are mean or evil people. I know we hear all the time about all the evil in the world, and there is far too much of it. And even if not evil, there are also many people who are rude, incompetent and unhelpful. We all know that. But we often forget that there are also many, many more people who are kind, helpful and competent. In my six months of doing this research, I have gotten help from many strangers—government employees who patiently helped me find a document, FHL volunteers who helped me track down a document request I had made, JewishGen and GesherGalicia members and other genealogists who have gone far out of their way to teach me how to find documents and how to connect with other researchers, who have photographed gravestones and given me directions to gravestones, who have translated documents for me, who have helped me find a clue when I was sure I had hit a brick wall. I cannot tell you how much these people have touched me and changed my views on human nature. I want to express special thanks and deep appreciation to Renee Steinig, who contacted me many months ago in response to my cry for help on GesherGalicia and who has truly been my teacher and is now my friend as I have gone from being a total newbie to a fairly competent novice with her guidance. She is the one who found the obituary of Renee that led to me finding Judy. She is the one who suggested I post an inquiry on a bulletin board that led me to Bruce. When I look back, in fact, I know it was Renee who got me to where I am today. Thank you, Renee, for everything. Lesson #5: If you ask for help, there will be generous and kind people who will reach out and help you. Don’t do this alone. 6. I have also learned that I have many second cousins and second cousins once and twice removed—people I would never have discovered if I had not started down this path. This has been probably the biggest gift of all from doing this research. What a wonderful and interesting group of people I have gotten to know—by email, by phone, by pictures and stories. When I look at the pictures and see the distinctive Brotman cheekbones shared by so many of you and your parents and your children, it gives me such a great sense of connection. This may be the best lesson I’ve learned: everyone is looking for connections, everyone is looking to find their place in time and in the world. I am so glad to have made these connections with so many of you, people who never even knew my name until this fall but whom I now consider not just cousins, but friends. 7. Finally, and in some ways the point of this whole adventure, I have really learned more than I ever could have hoped about my great-grandparents and their children and how they lived in the United States. Joseph and Bessie were nothing but names to me six months ago; now they are flesh and blood people, my flesh and blood. Their drive and courage is an inspiration to me, as it must have been to their own children. After all, Abraham, Hyman and Tillie all named a son for their father Joseph, and perhaps some of the great-grandchildren were named for him as well. I was so blessed to have been named for Bessie, as were some of you. Bessie and Joseph—they are the real heroes of this story. That’s the real lesson. 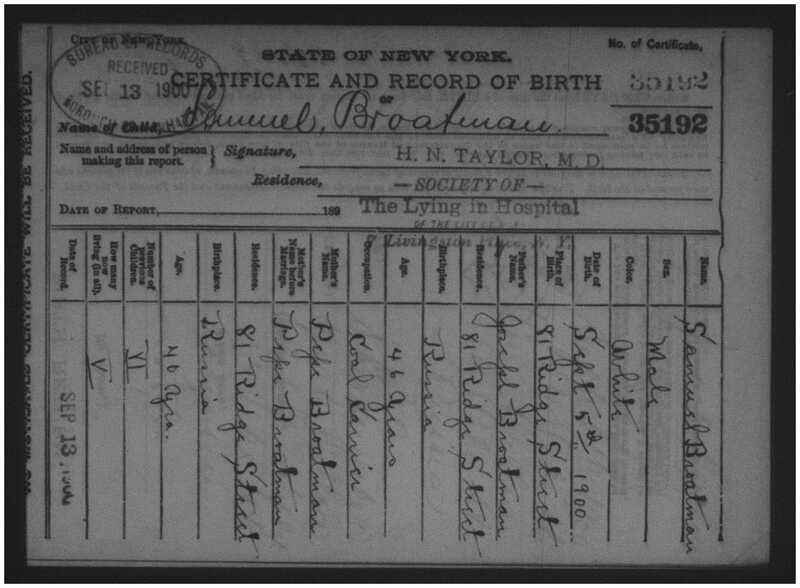 This entry was posted in Brotmans, Genealogy, Miscellaneous information and updates, Reflections and tagged Abraham Brotman, Bessie, Bessie Brotman, brotman, Family, Family History Library, genealogy, Hyman Brotman, JewishGen, Joseph, Max BrOtman, vital records by Amy. Bookmark the permalink. Hi Amy. I’m Steve Steinig, Renee’s husband. I loved your December 19 posting. One reason I’m replying is to recommend volunteering to give a talk for beginners at next summer’s Seminar. These are seven valuable lessons for emerging genealogists to know, and wrapping a story and some documents around the lessons, as you’ve done here, provides for much better learning than just their straightforward presentation. The second reason I’m writing is to tell you how much I enjoyed reading your gracious thank you to Renee. But I must tell you, that part of your posting wasn’t as original as your family stories. 🙂 A few years ago, I went to the Summer Seminar with Renee. Every day, I met a lot of people over coffee and the like while Renee wasn’t in the room. After introducing myself as Renee’s husband, a great many of them replied with things like, “I once was telling Renee about a problem I hadn’t been able to solve for three years, and she gave me a suggestion that led to me solving it a week after I got home,” and “when I was new, I posted something on Jewish Gen and got a three page reply from Renee with detailed instructions on how to proceed,” and on on. So now I can add your posting to the collection of people who agree with me about how wonderful Renee is. Best wishes in your genealogical pursuits. Steve, thank you so much for writing. I really appreciate your comments, and it’s great to know that Renee is well-appreciated by others (not that I am the least bit surprised) and especially by her husband. I don’t know anything about the seminar you referred to, but as a teacher, I’d love to share my own learning and experiences with others. I will check into it, Thanks!